What child doesn't enjoy a game involving candy? 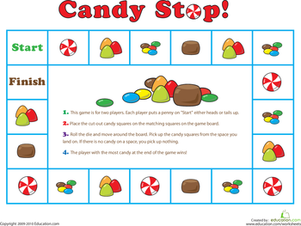 In this colorful printable board game, children roll a die to move around the board, collecting candy along the way. After both players have reached the end square, they'll each count their bounty of candy. The one with the most pieces wins! As they play, kids will practise counting and number recognition. To ensure the board looks its best, use a colour printer and heavier paper when printing. This pumpkin game is fun for Halloween parties or just an after trick-or-treating activity. Play this pumpkin game with your little ghosts and ghouls. 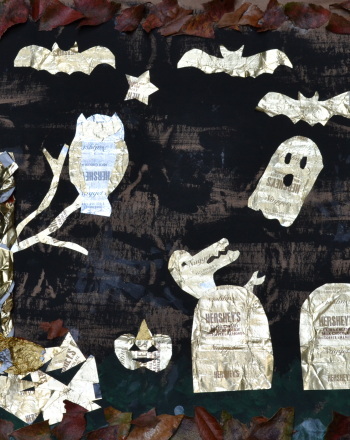 This candy wrapper collage is a cool upcycled craft for after Halloween. Make this candy wrapper collage with all of your leftover candy wrappers. Everybody loves candy! Satisfy your sweet tooth with this fun candy coloring page. 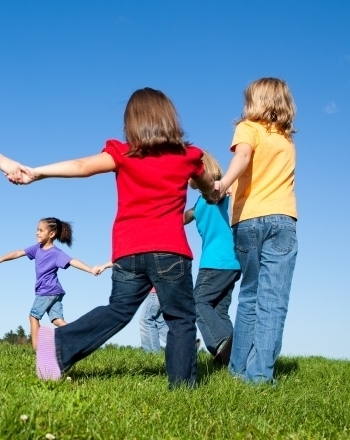 Entertain your next batch of energetic youngsters with a Halloween-inspired candy hunt! 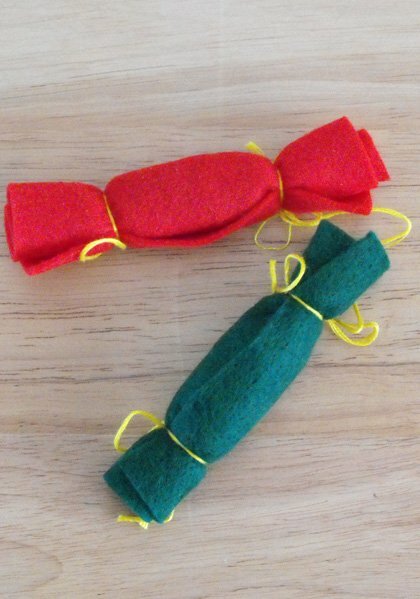 Make these sweet-smelling sachets that smell like delicious cinnamon candy. Amy sells a lot of candy in her sweet shop, but needs help sorting and counting them. Kids help out by coloring and counting the candy. This candy cane coloring sheet is a sweet activity for a cold winter's day. 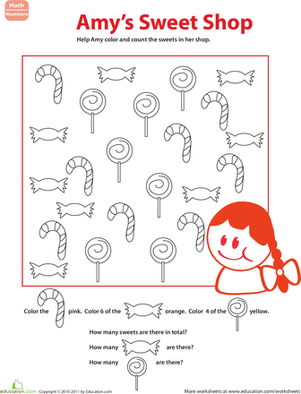 colour in this candy cane coloring sheet with your child this holiday season. 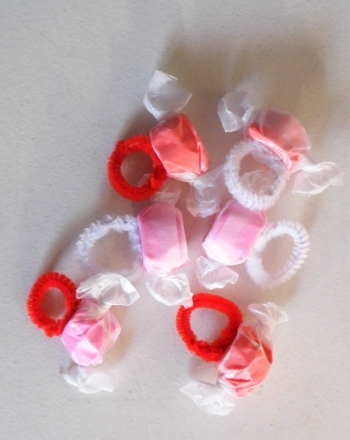 Make candy hearts this Valentine's Day. 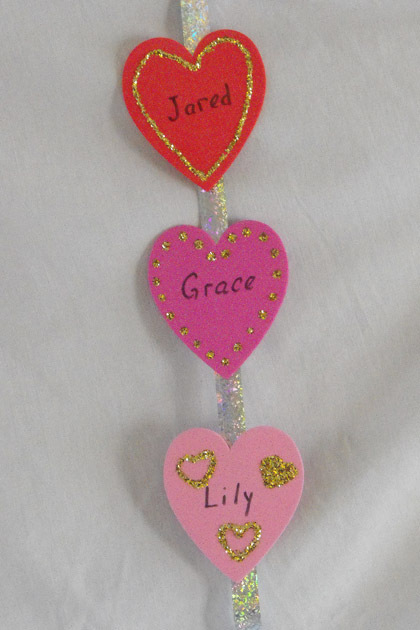 This heart-y project helps your little one practise handwriting skills and encourages creativity. Help Penny and Sam sort out their Hallows-Eve hauls in the Halloween candy maths worksheet. 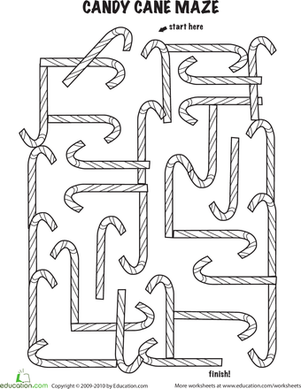 This printable holiday candy cane maze is sure to get your kindergartener in the holiday spirit.